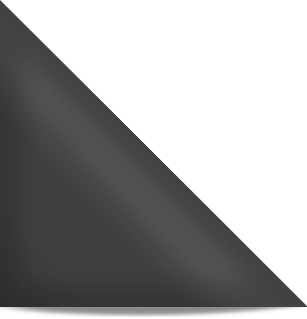 I don’t use this blog to crow about what I do, but something interesting has dawned on me and, well, I wanna crow about it. Am I the only headhunter on Google? Before you roll your eyes and chuckle at that… Google “headhunter”. 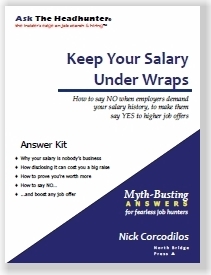 The top 10 results include Ask The Headhunter (that’s me)… and no other headhunter. So, why is it that I turn up high in the Google results? Google ranks web sites based on the extent to which they are referenced by other relevant websites. What does that mean to people who search for headhunter on Google? 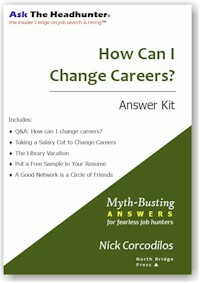 To start with, people look for headhunters because they want job hunting help. 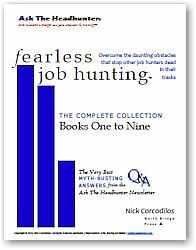 But since headhunters fill only a tiny fraction of jobs, you’re not very likely to ever have any contact with a credible headhunter. As far as Google goes, I’m it. And I’m very up front about the statistics. In fact, I’ll tell you outright that I’m not going to read your resume or place you in a job. I don’t use Ask The Headhunter to recruit or to solicit headhunting business. So what does it mean when someone finds me when they Google headhunter? It means a lot of other busy, relevant websites think you’ll learn something about job hunting and hiring by going to Ask The Headhunter. It means there is one headhunter by name out there who will tell you how to use a headhunter’s methods yourself. And that’s all I offer or promise. Many Ask The Headhunter readers get that and they’re willing to do the hard work to apply the very basic methods that we discuss on the website and in this blog. And that’s kept me doing this for almost 15 years: the fact that you get it. And there’s no question that I’m tickled to be the only headhunter in Google’s top 10. I’m very grateful that lots of other highly-ranked websites link to Ask The Headhunter. I just had to crow. NEW! Subscribe to comments feature! Not to burst your bubble, Nick…but EVERYONE knew this. Still, glad to see you at the top where you rightfully belong. I’m curious if you tried this on a PC that hasn’t gone to your blog would the results still be the same as you coming from a machine that has already made multiple visits to this site. I’m asking because I’m noticing how the top 4 listed in the graphic all show 2-3 visits to the sites so the results may be different than if say I googled “headhunter” here. For example, if I who is in Canada google “headhunter,” I don’t get your blog coming up in the first page of results and I read your blog regularly. 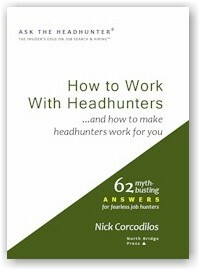 Though if I google “ask headhunter” then I get a few different sites about you, or an Amazon.com link to your book, etc. I just wanted to point that out. @JB King: Doesn’t seem to matter which PC you search on. I’m referring to Google’s web search. I have been following you for my whole career, from junior recruiter to now owning and running a successful Recruitment / Search firm. I often refer people I am working with to your site for guidance since it is so empowering. In relation to the term “Headhunter” I know in Australia it has become cheapened by a lot of wannabe firms pitching themselves as search specialists in the late 90’s and earlier this decade. These sharks – big on promise, short on delivery – have eroded confidence in the entire retained search model and made headhunter a dirty word out here. I’m sick of all the euphemisms…and I don’t believe the contingent recruitment model is sustainable for specialist or senior recruitment. Contingent recruitment is a mugs game and allows the lowest common denominator to set the tone for the industry. Let’s be proud of being headhunters. Thanks for being the only headhunter on Google though. um… JB King is kinda correct. “Where” the searcher is located has a lot to do with the results Google shows. I am in Australia and you do not appear on page one of my listings. You appear as the second (non-paid) listing on page two of the results. Fastcompany.com is number one on page two. Sorry to burst your bubble there. Love your work anyway. I have spent the last two days destroying my resume to build a ‘working resume’.